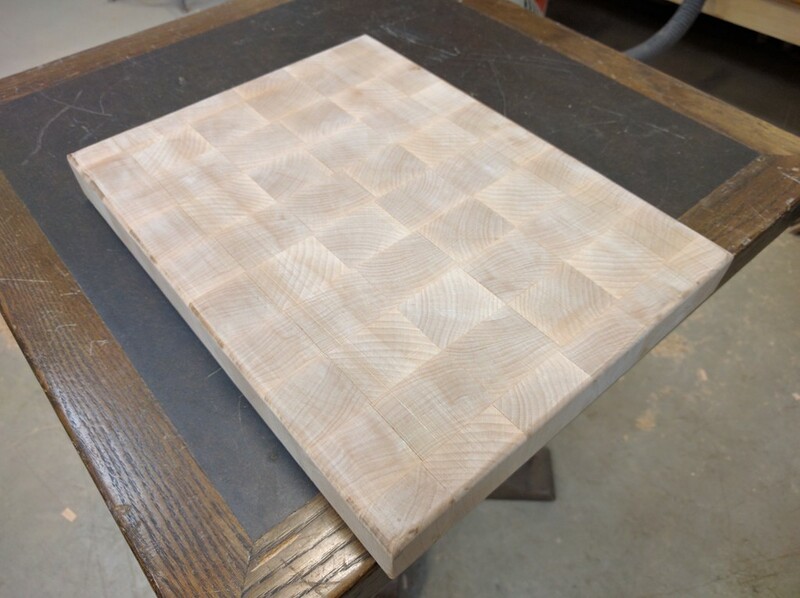 I made an end-grain cutting board, and it’s about the coolest thing. 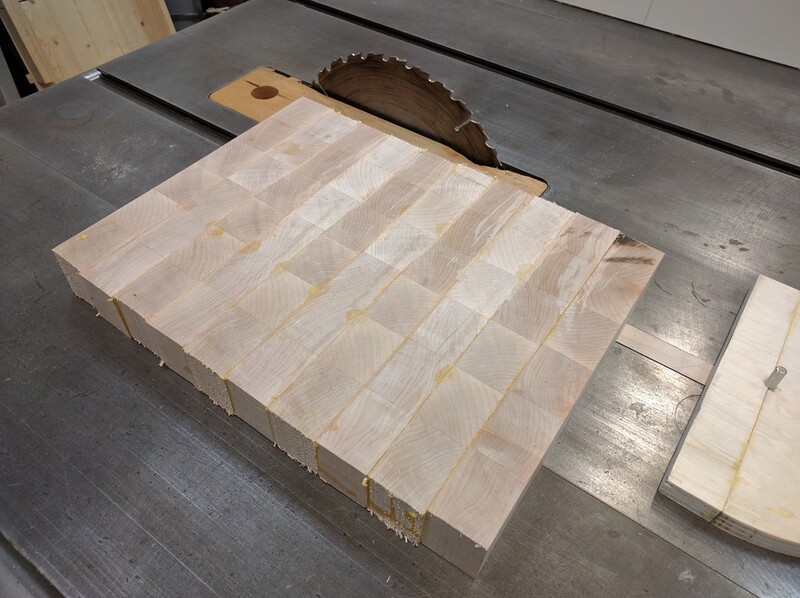 It’s 1 3/4″ thick and made from white maple. I’ll take you through the steps I followed. I’ve been a metal guy for years now. I love welding, I love machining, but recently I discovered that glued wood joints can be far stronger than I ever thought. 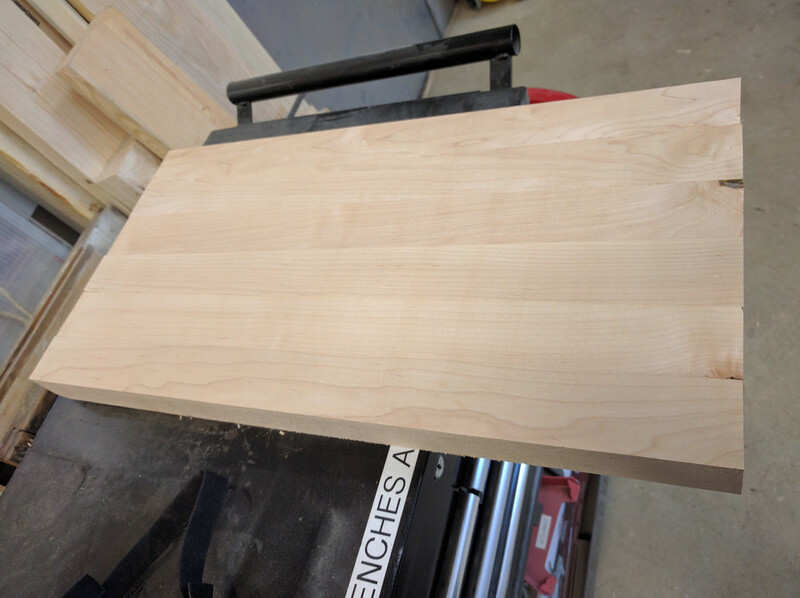 We kinda needed a second cutting board, so I watched a few videos and read a few guides and decided I could probably build one. 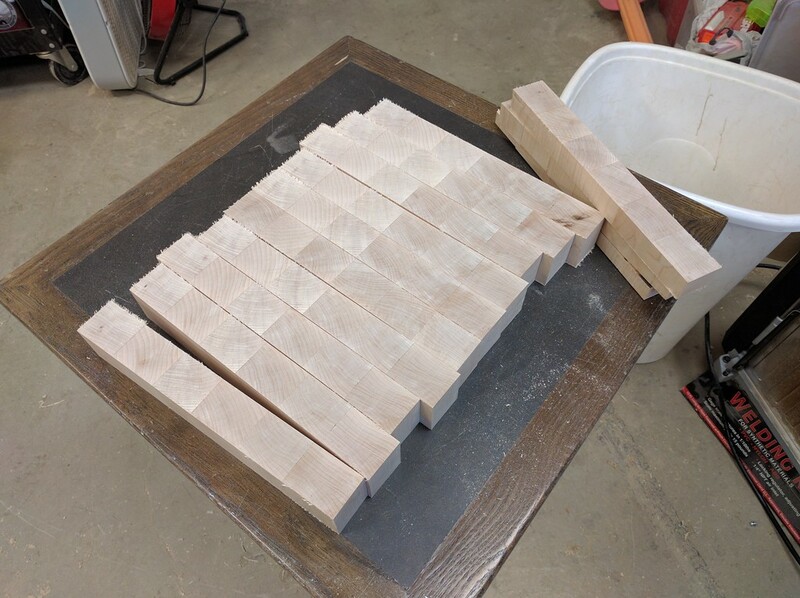 Last Wednesday I sketched out some plans, and worked out that I needed two pieces of 8/4″ wood measuring at least 7 1/2″ by 24″, ideally walnut or maple or cherry. 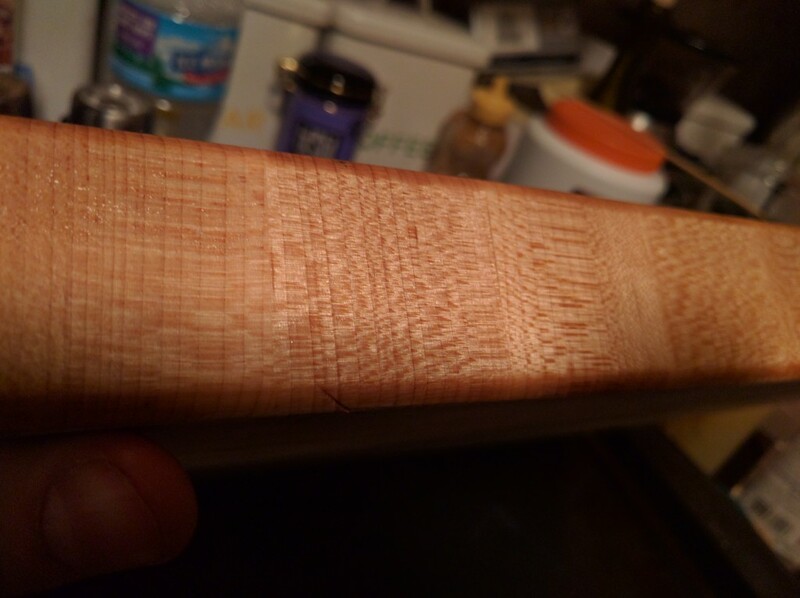 I went to Owl Hardwood on Wednesday night and picked up a really nice piece of 8/4″ walnut, measuring about 49″ by 10″. That piece was about $60 out the door (nice hardwood is surprisingly expensive!). 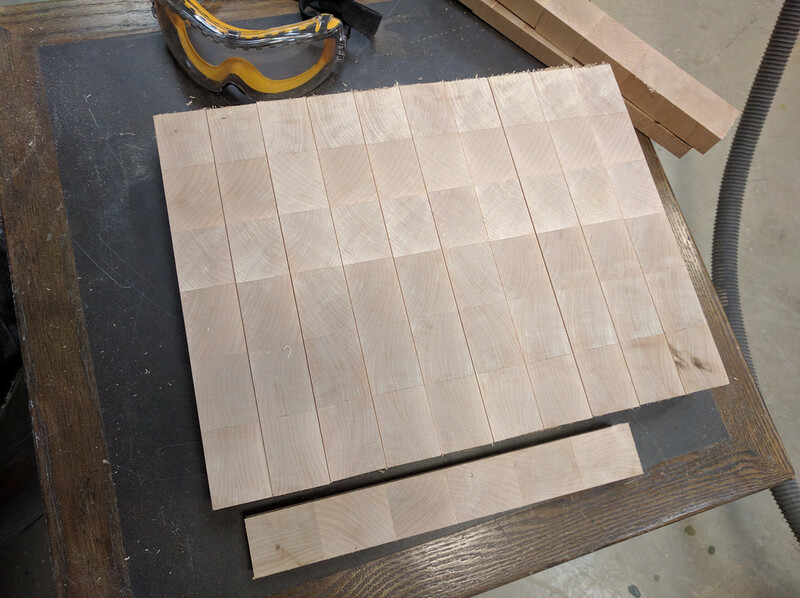 I took it by the [South Side Hackerspace](https://sshchicago.org) on Friday, cleaned up the edges, and cut them into two inch strips, and got them glued together. 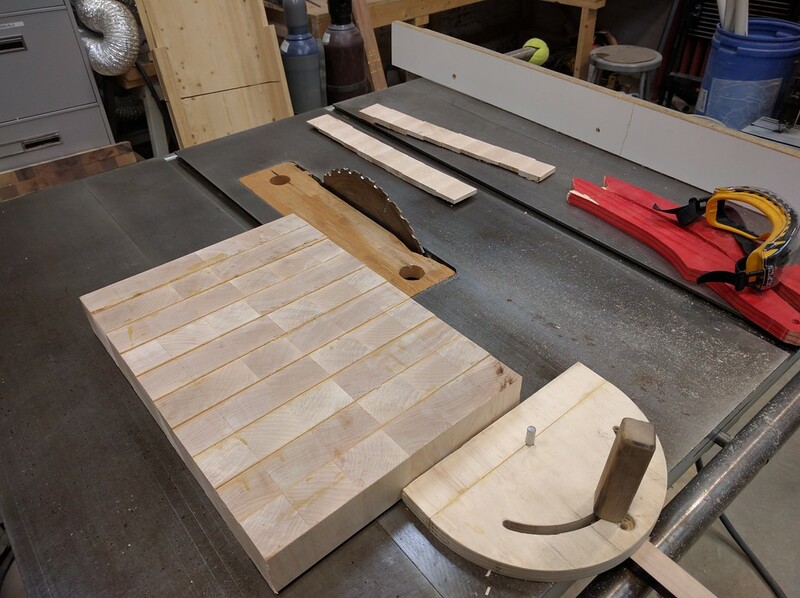 Of note, the table saw sled I used was not perfectly square. I wound up having to flip some of the strips around so that the resulting workpiece was more or less square. 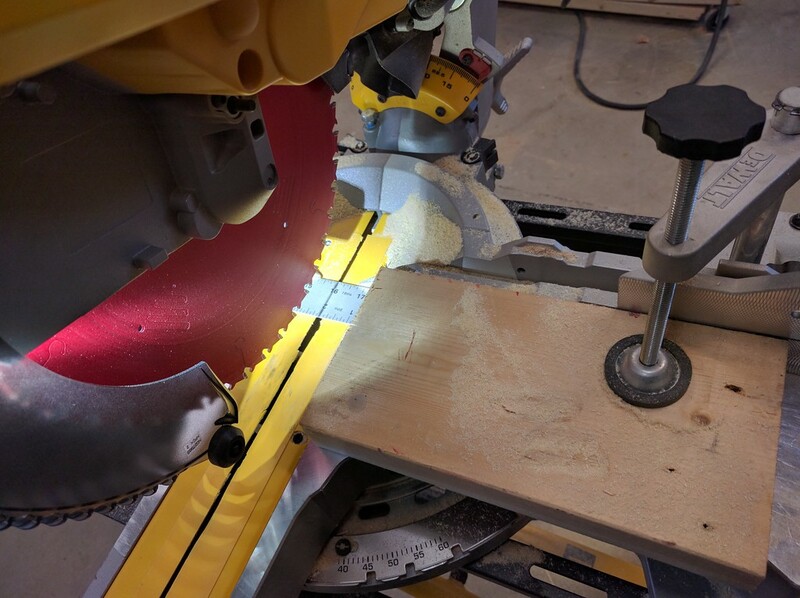 I’ll probably have to build a new table saw sled one of these days. 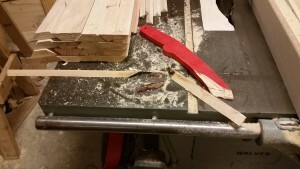 Wary of the out-of-square sled, I cleaned up the edges on the sliding compound miter saw. I was able to work quickly and keep burning to a minimum. 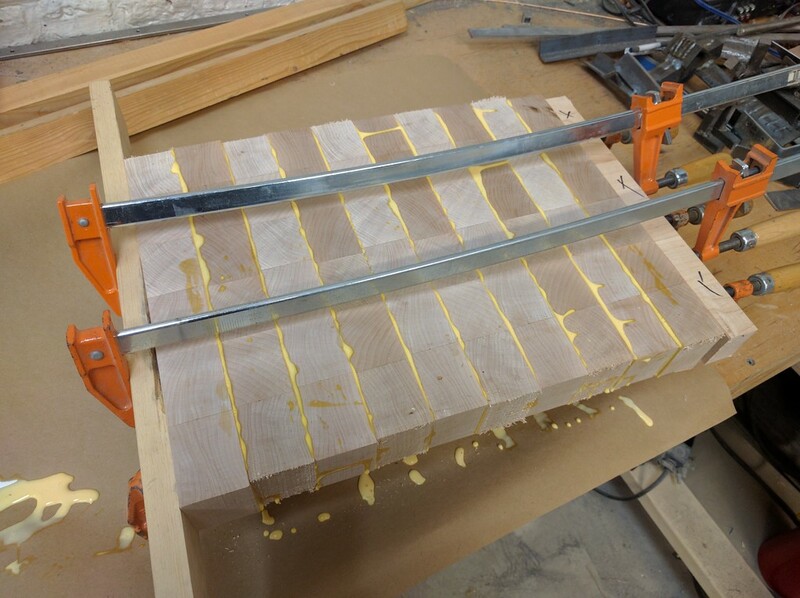 I made a jig out of a precision scrap of pine 2×6, and set that at 2″. and I set the strips on their sides, like so. 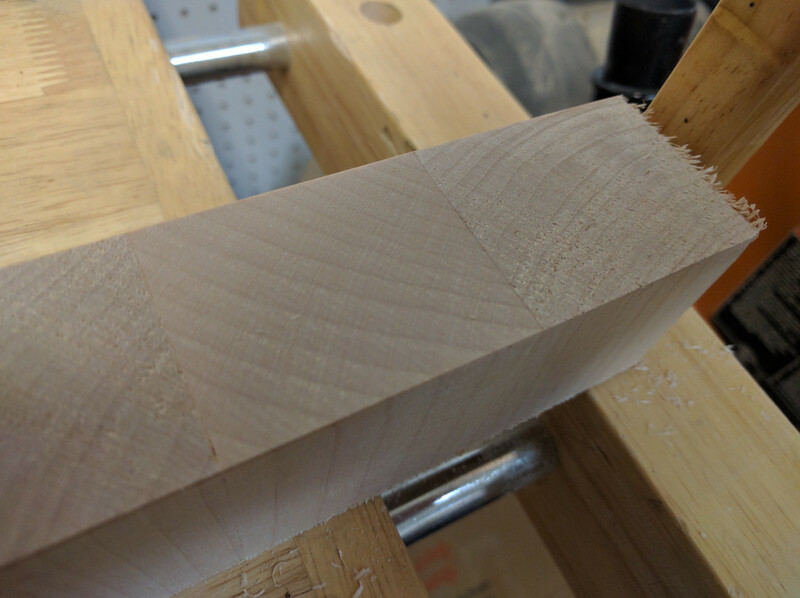 The strips had a little bit of tearout on the sides that was preventing them from joining up nicely with one another, so I put the smallest chamfer on the corners with a Stanley #27 block plane. 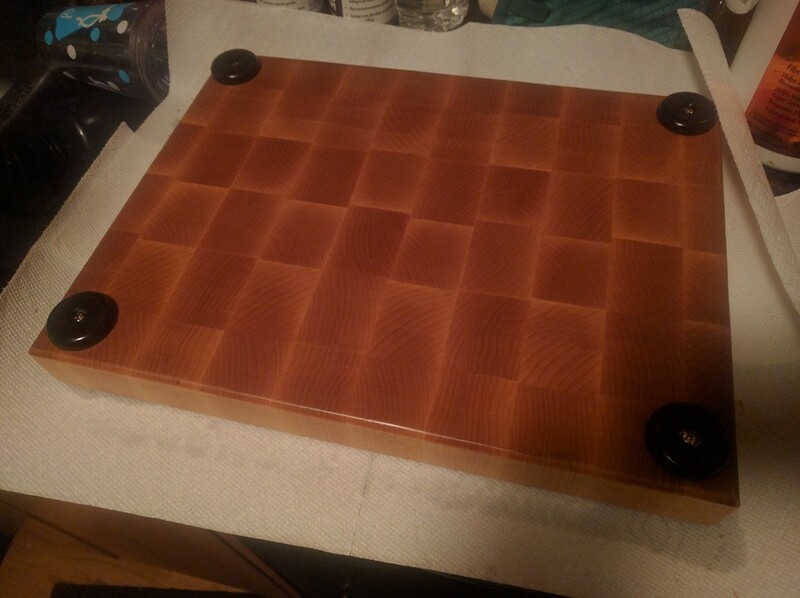 I arranged the pieces in the clamps and flipped every other piece around to get a nice checkerboard pattern. and gave it the squeeze. After letting it sit about an hour, the glue was hard enough to work with. 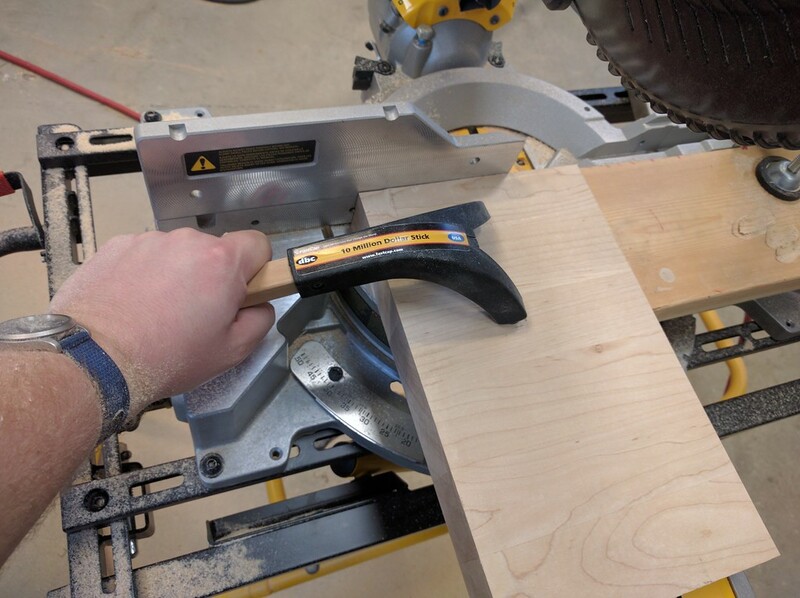 I squared up the miter sled on the table saw and cleaned up the edges. 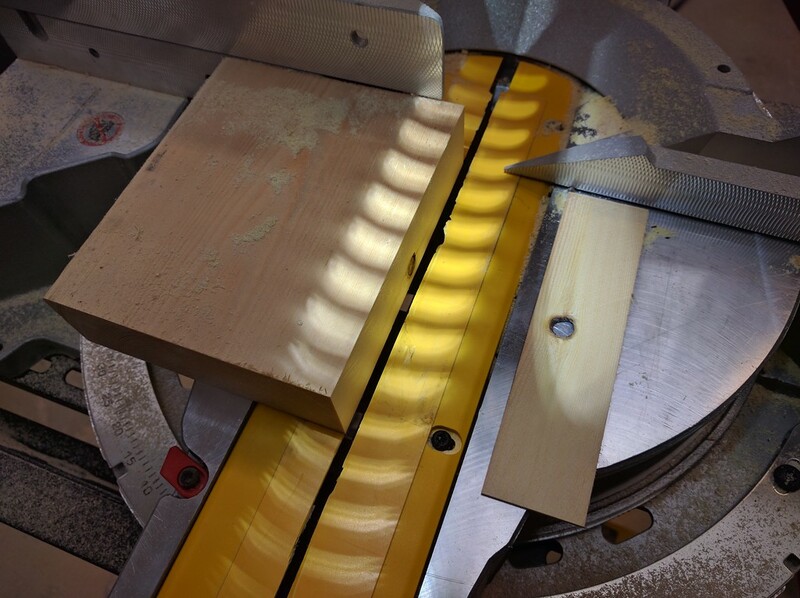 I then planed the workpiece down. 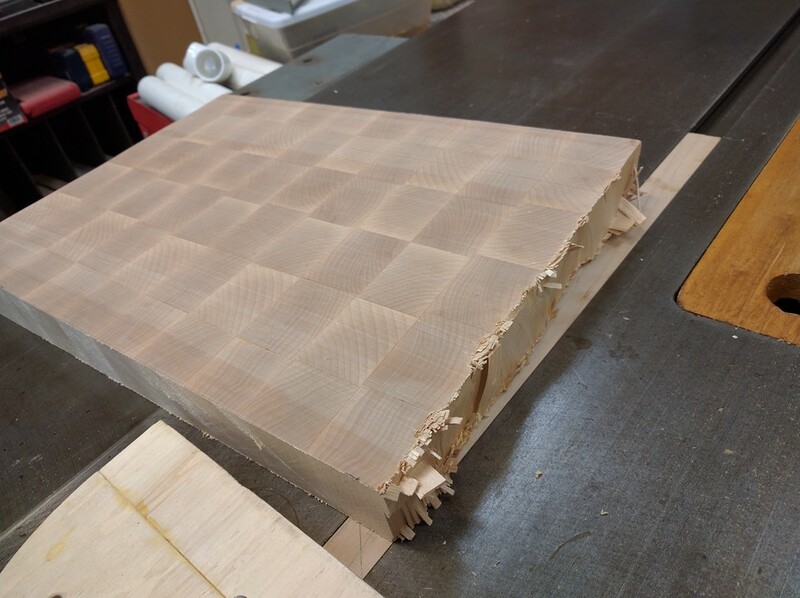 The planer was really disliking cutting the end grain like that, so I wound up having to go super slow, turning the height adjustment no more than 1/8th turn at a time (probably taking off somewhere between 1/64″ and 1/32″ at a time). 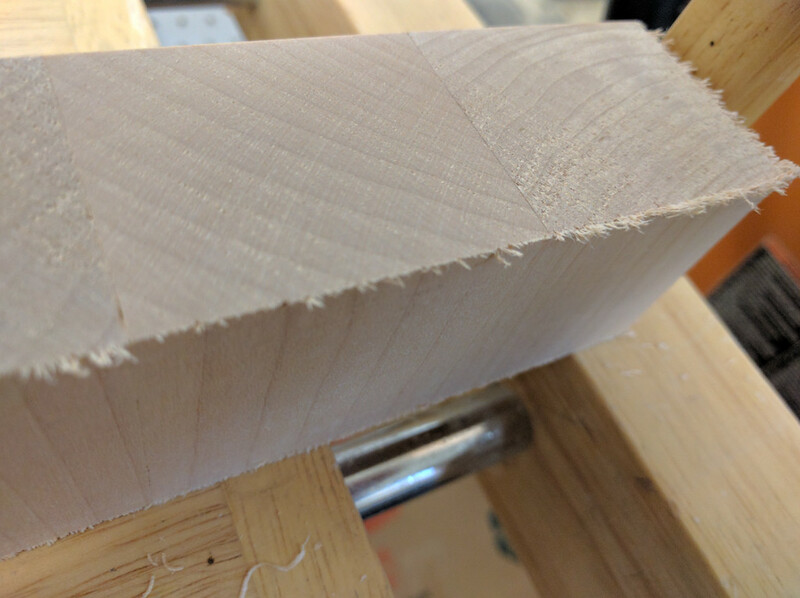 The planer really beat the trailing edge to heck, so I cleaned that up on the table saw as well. 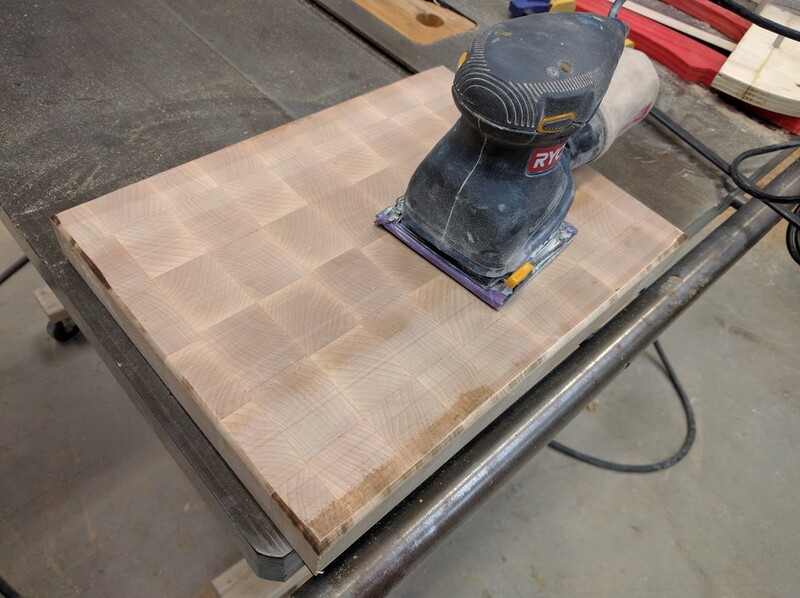 I put a 1/4″ roundover on the corners with a router, then started sanding. Two problems exposed themselves here: First, I really should have bought new sandpaper (maybe starting with 80 grit, then moving up to 200 and finally 400 grit) rather than just using the 200 grit that I found. 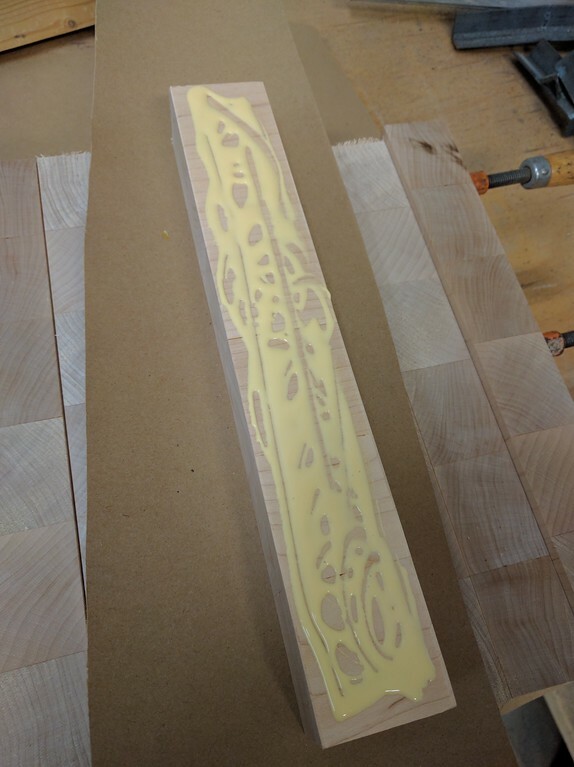 The planer’s blade needs replacing, and it left some deep scratches in the surface that sanding was able to minimize, but you can still see them. 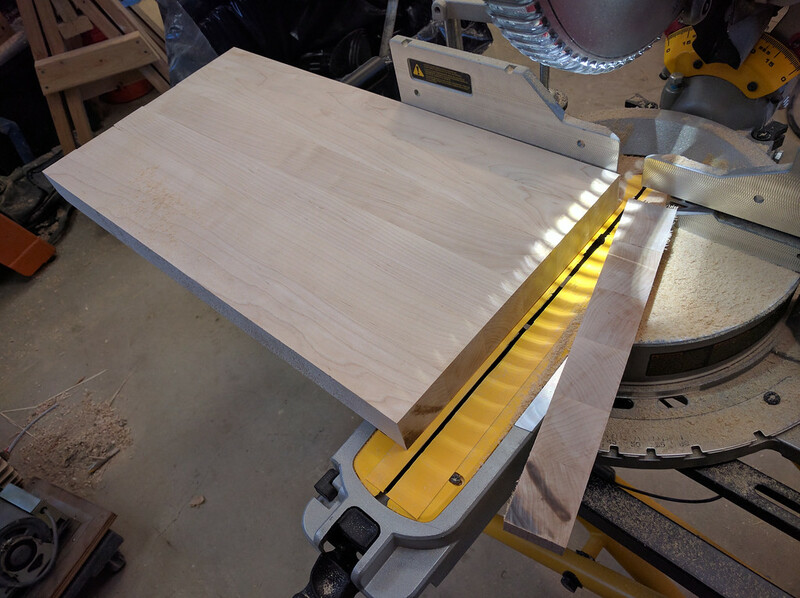 Second, sanding on the table saw like that caused me to pick up some of the 3 in 1 oil I used to oil the table. Whoops! Finally the workpiece was sanded and ready to take home. 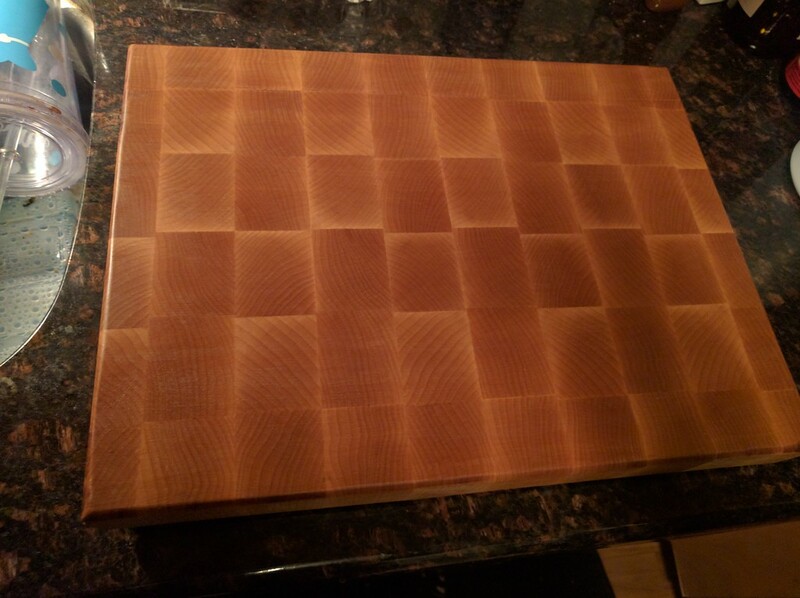 I bought a couple bottles of butcher block oil (just food grade mineral oil) and a thing of butcher block wax (just food grade mineral oil and bee’s wax) from the Home Depot. At this point my friend [Erin](http://hey-er.in/) will be yelling “No you idiot it’s so much cheaper to buy that oil in bulk! I told you I had some!” But it was late, and I was impatient, so I was willing to spend a few extra bucks to get it done. Once home, I soaked both sides in oil. I poured a bunch on, spread it around with a paper towel, and waited 15 minutes. I did this three times per side with the oil, then once per side with the wax. 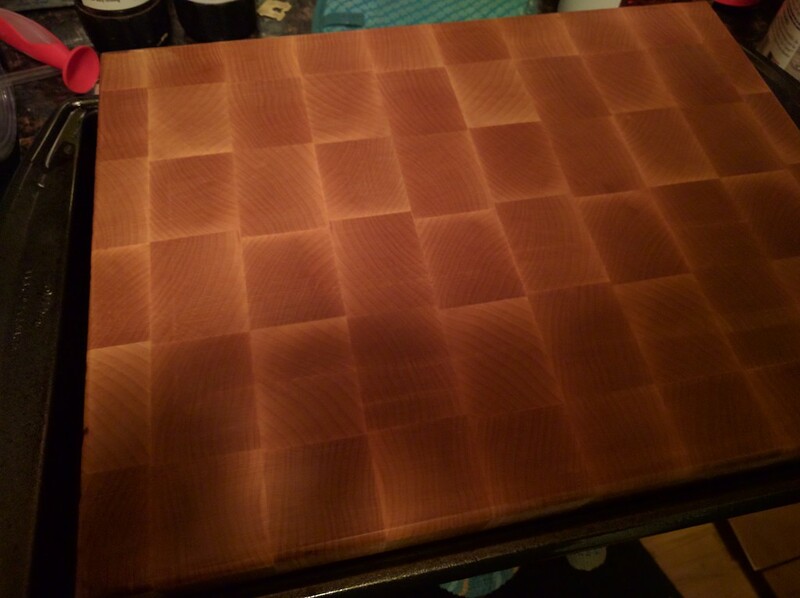 The oil brought out the wood’s pattern, and it looks amazing. My wife helped me pick which side was the bottom, and I installed some anti-skid rubber feet. I might replace the screws with stainless hardware down the road, but this will work for now. 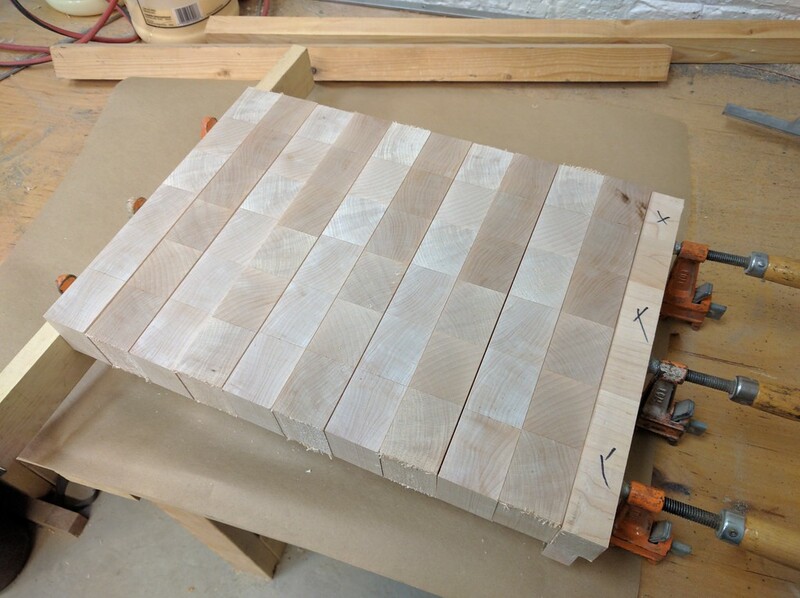 Deciding to install feet on one side is a trade-off; I could leave both sides open and make the cutting board reversible, but having feet on the bottom makes it slip around less and also lets air flow on the underside to help it dry off. As an aside, installing the feet was my first chance to use my new Makita drill and driver, so I was excited! I flipped it back over and let it sit overnight. The oil oxidizes and forms a semi-hard sealing layer. I re-coated the board the next morning, and again later the next day. I got to use it last night to chop some star fruit, and I can’t tell you how exciting it is to have made something this beautiful and functional with my hands. 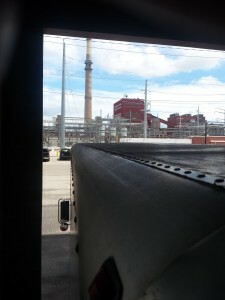 One thing we’re doing well now is providing safety equipment. Make sure you use it, please! Erin was using push sticks, safety glasses, and a full face shield. She left the space with 10 fingers and 2 eyes. If you’re working with power tools, please make sure you understand what you’re doing, and that you take the appropriate precautions. The SSHC was at the South Side Mini Maker Faire this weekend, and we brought hella NERF guns! 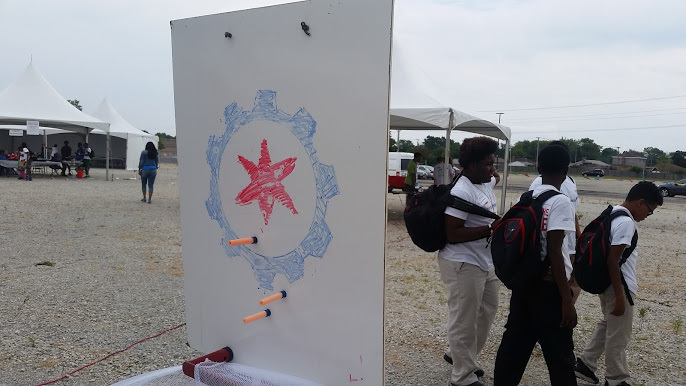 NERF hacking event on August 22! More details to come! 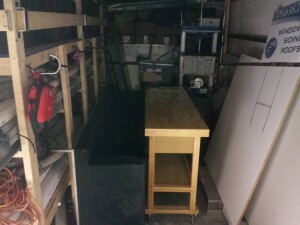 Moving a hackerspace is hard work! 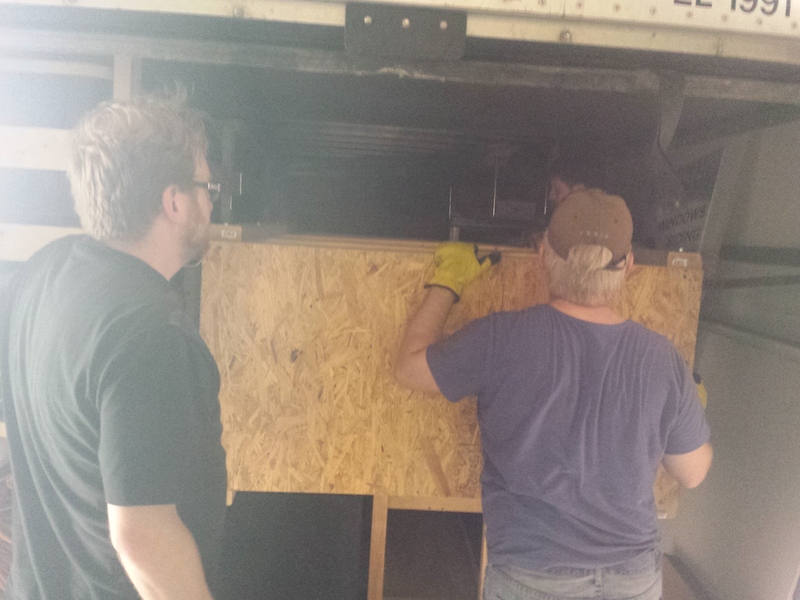 Today, members Phil, Andrew, Steven, and Chris met to load up the last truckload before we can occupy the new space. 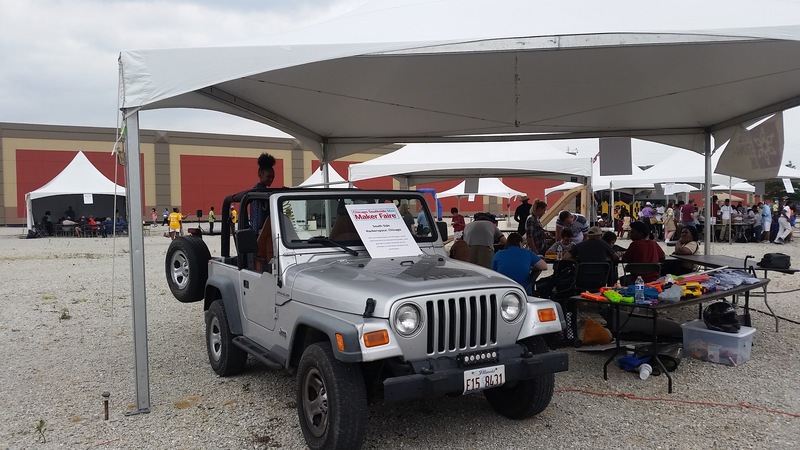 Many thanks to all the members and non-members who turned out this weekend to help out! 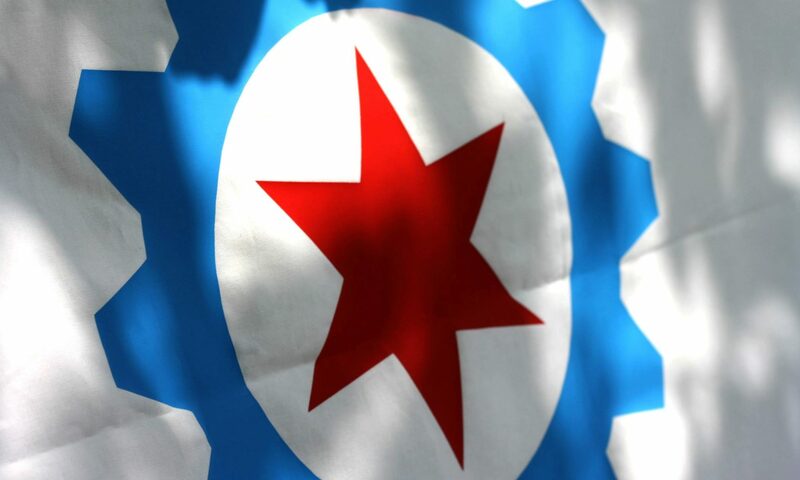 This afternoon, SSH:Chicago made an unprecedented step in radical hackerspace transparency: we started actively publishing our finances. 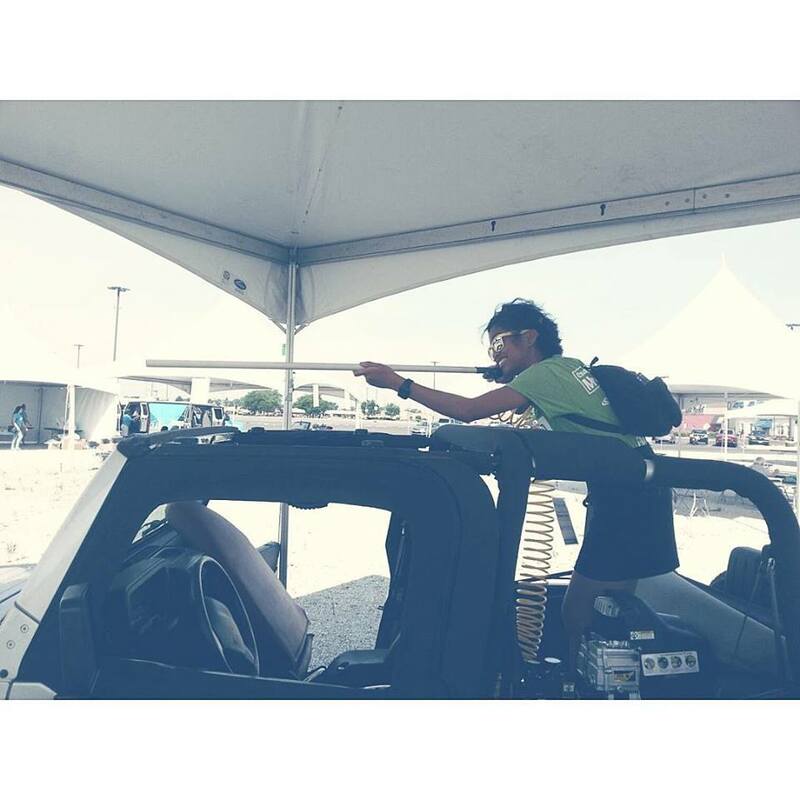 I came up with the idea back in December, when I started as the treasurer here and had no idea what was going on. I didn’t know how much money we had, or what we were spending it on. Once I saw how the sausage was made, it became a lot easier to make decisions and help shepherd the space. When I proposed the idea, the biggest issue was our 501(c)3 application. There’s no reason it should have interfered with 501(c)3, but the board agreed that I could go radically transparent once we achieved 501(c)3. So I waited. While I was waiting, I started experimenting with accounting software. I eventually settled on Ledger-CLI, which is super nerdy and hackerspacey. I developed a workflow where every few days, I log into our bank account, copy our new transactions into the ledger, and then run Ledger to verify that I got it correctly. I want members at our hackerspace to be able to make informed decisions, and, I think, with these data, they can. 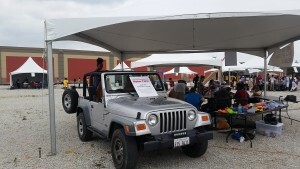 I was hacking at the space last week. I had brought my old Nikon D1X along, wanting to take some photos, but the battery was dead! I didn’t have the charger at the space, so what’s a guy to do? I did have a variable power supply with a current meter available to me, so I devised a solution. Using a voltmeter, I figured out which was the positive and the negative terminal, then I hooked that up to the power supply. I adjusted the power supply so it read .9A, and waited. I noticed that after 10 minutes or so, that had dropped to .7A, so I turned the voltage up a bit. 10 minutes later, same thing. 10 minutes later I disconnected the battery, and it was charged! Last week, we made another Home Depot run! Dustin, Ryan, and Dmitriy went to Home Depot and loaded up on drywall, while I rented an iGo pickup truck to haul it back to the space (an aside: as a southerner I naturally like trucks, so this was a treat for me). We picked up 16 sheets, a bucket of drywall mud, some putty knives, and a drywall square. We got it back to the space, where Matt and Tim met us and helped stash it in the framed-out metalworking room. This weekend, Mason, Dustin, Dmitry, and I got together and started the actual drywalling process. We got the wall that faces the common area covered nicely, as well as the wall that separates the two rooms. I installed the sliding glass door into the wood room wall. All in all, it looks like a space now! Pictures to come. Last night, Dustin, Dmitriy, and I met at the space to continue building the space. To recap: before we got there, most of the walls had been framed out, and there were only a few that needed to be tap-conned to the floor. Dustin framed the last piece that needed to be framed, and he and I were able to tap-con a few more segments down before our downstairs neighbors yelled at us for being noisy. We switched to cleanup mode, and got a lot of cleaning done before Dmitriy returned with a 1×4. Together, the three of us got all of the interior doors installed, and the server room wall secured. The side wall of the metalworking room still needs to be attached to the existing wall with angle brackets. The front wall of the metalworking room needs one or two more tap-cons attaching it to the floor. I think we will try to make a drywall run on Wednesday, and then we can start drywalling!